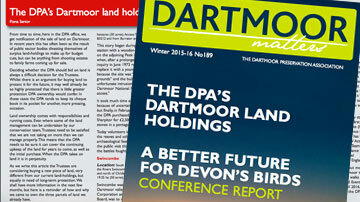 DPA volunteers started a new project on 19th November last year, in quite bad weather. In two words, it poured! On Tues. 12th February, we had a much better day. 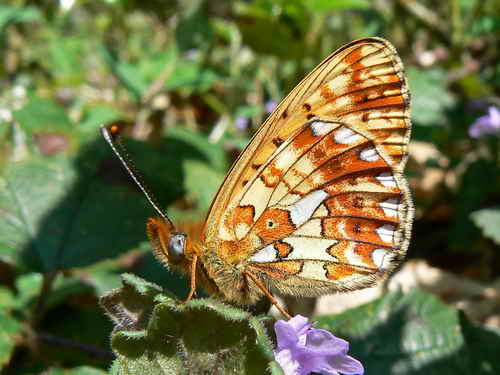 The project is butterfly conservation at Common Wood, “near Horndon”. 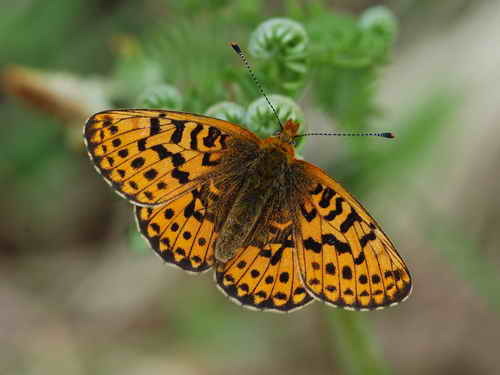 This is an isolated woodland with scrub extending up the valley sides of the River Tavy and it is here, under favourable conditions, that the rare and declining Pearl-bordered Fritillary can breed. The butterfly prefers fairly open areas with bracken and flowers whereas this area has been neglected for a long time and gorse has made a fairly dominant showing with small hawthorn trees beginning to grow as well. 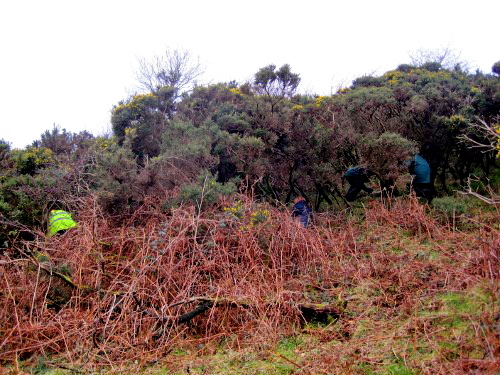 While DPA volunteers are more than a little familiar with cutting gorse it seems contrary to our ethos to encourage bracken to grow – we are normally clearing it from areas of archaeology! As is clear in the photograph above, this butterfly is a striking species. 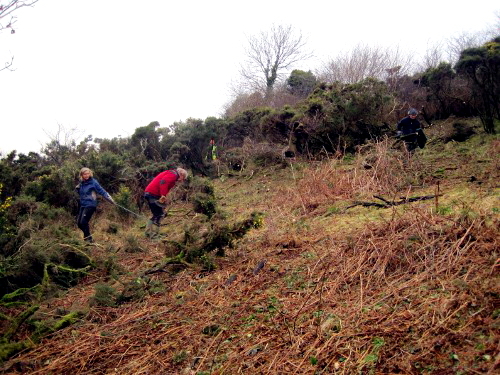 “Before” – plenty of gorse, bramble and bracken. 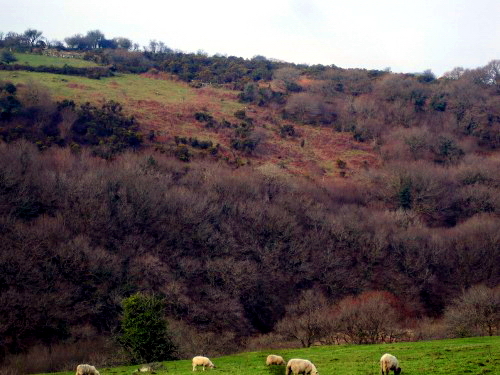 The photograph above shows the wall of gorse that covered much of the slope down to a thin belt of trees just above the leat that runs to Mary Tavy Hydro-electric Power Station. 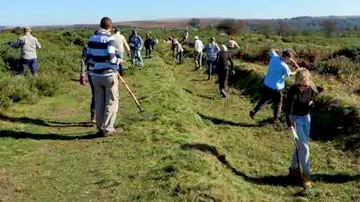 “During” – volunteers at work. Although it does not look a lot, we have to thank Bill, Chris and Jill, Derek, Hilary, Jane, Jenny, John and Elaine, John and Rachel, Sylvia, and Val, plus myself making 14 willing souls. 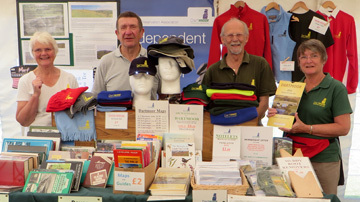 It does not take long for this many people to make a difference on the local scene, as seen in the photograph above. 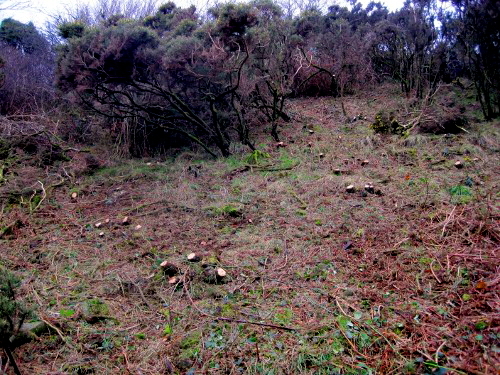 “After” – gorse stumps are easily seen and some bramble has been removed. After an area is cleared, it can look very different, as the photograph above shows and as views across the valley (below) will show. The requirement is to make cleared “islands” where the bracken can grow with flight paths between remaining “stands” of gorse. The cuttings are put to good use – making a “windrow”, this is a long, static pile of carefully stacked cuttings and brash that forms a habitat pile for insects and small mammals while it slowly composts. 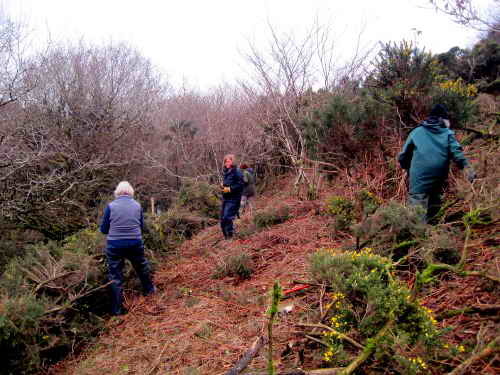 In brief, the photographs above show DPA volunteers clearing gorse and scrub from bracken slopes at Common Wood to improve habitat for the rare and declining Pearl-bordered Fritillary. 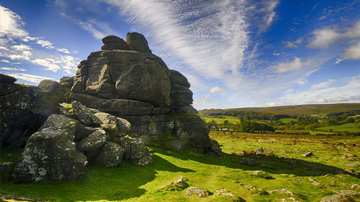 The work is being carried out in association with Butterfly Conservation, whose aims are to save butterflies, moths and their habitats, and is part of a Dartmoor-wide scheme to increase the extent and quality of breeding habitat for this beautiful butterfly. Common Wood from across the valley – 1. 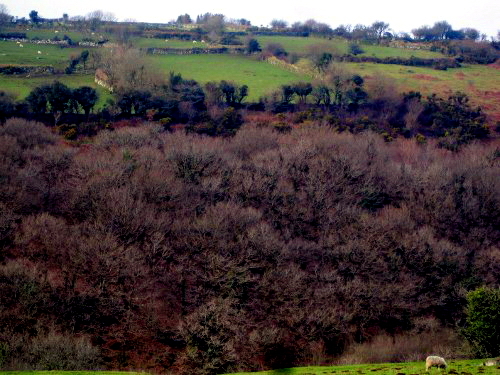 The view above, from across the valley, shows the area we have cleared, at the centre and towards the right, while more gorse awaits towards the left side. Common Wood from across the valley – 2. This photograph shows there is more gorse waiting to be cleared but it is not as dense as the area we have already cleared.